Dentate Granule Neurons Generated During Perinatal Life Display Distinct Morphological Features Compared With Later-Born Neurons in the Mouse Hippocampus. Thomas Kerloch, Solène Clavreul, Adeline Goron, Djoher Nora Abrous, Emilie Pacary. Cereb Cortex. 2018 Sep 12. doi: 10.1093/cercor/bhy224. The dentate gyrus (DG) of the hippocampus is one of the few mammalian brain structures where neurogenesis is maintained throughout the lifetime of individuals. Indeed the dentate granule cells (GCs), the main neuronal cell type in the DG, are generated via several distinct phases occurring during late embryogenesis, the early postnatal life, the juvenile period and throughout adulthood. Because of this continuous addition of new cells, the DG appears as a heterogeneous structure composed of different populations of granule neurons. Whether these different populations have similar or distinct structural and functional properties is still a matter of debate. Surprisingly, although most dentate GCs are generated during development, little was known about their properties compared to adult-born neurons. Nevertheless, it was generally admitted that these populations are morphologically indistinguishable once mature. However a detailed and extensive analysis of developmentally-born neurons was lacking for proper comparison. In this study, we used in vivo electroporation to label dentate GCs generated in mouse embryos (E14.5) or in neonates (P0) and followed their morphological development up to 6 months after birth. Importantly, we highlight for the first time major morphological differences with GCs born during the juvenile period (P21) or during adulthood (P84). 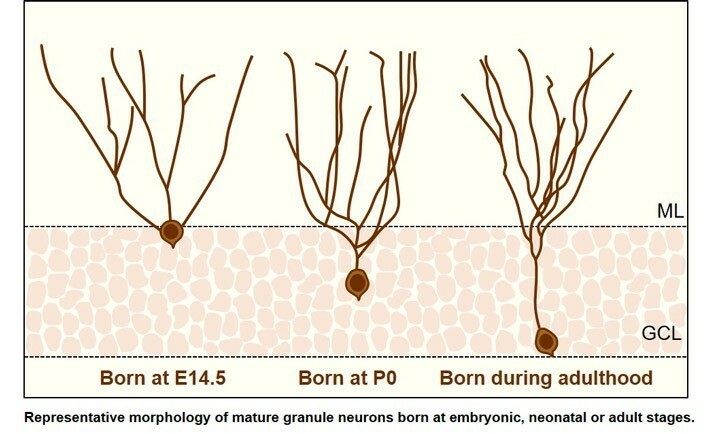 Importantly, we also identified different morphological parameters that can be used to predict the birthdate of granule neurons in adult brain sections. In addition, our data indicate that two other poorly studied populations of GCs in the DG, the semilunar and hilar granule cells are generated during the embryonic and the neonatal periods respectively. Thus, our findings provide new insights into the development of the different populations of granule neurons in the DG and open new questions regarding their function in the brain. Indeed, the dendritic tree determines the amount and specificity of inputs a neuron receives and is involved in sophisticated signal processing and neural computation. Consequently, mature dentate GCs born at embryonic, neonatal or adult stages might contribute differently to hippocampal function. Future analyses of the inputs and functional properties of the different populations of GCs using in vivo electroporation might help to address this controversial question.